✘ You can only change the temperature increments on this air fryer in 10 degrees, so it doesn’t give you a ton of room for precision when you are frying, cooking or baking. ✘ The basket is pretty sharp and can scratch away the non-stick coating on the inside of the lid of your fryer. If you are looking for the perfect present or gift for your favorite foodie or health fanatic, this air fryer would make the perfect addition to their kitchen. This versatile appliance is perfect for doing everything from frying up some chicken, cooking burgers, roasting vegetables and even baking cakes. It gives you all of the selection options and settings that you need to perfectly cook the fried foods that you love, without ladling on the unnecessary calories that your traditional fryers use by soaking food in hot oil. 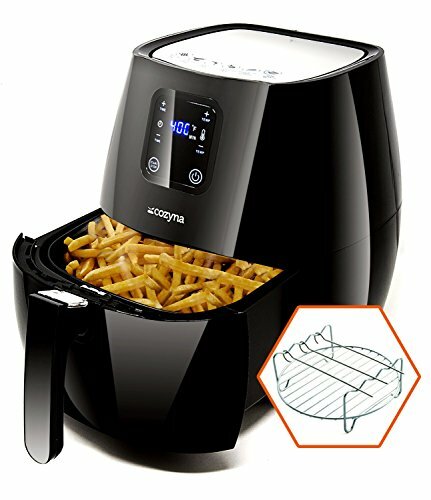 Anyone can appreciate that this air fryer is going to take the fried foods that you know and love and make them so much healthier. The only real drawbacks to this model are some of the small manufacturers issues that it has, but that doesn’t hinder the use and function of the fryer. Just know that you may not be able to dial in the precise temperature for what you are cooking. Air fryers are a truly innovative modern appliance in cooking technology. 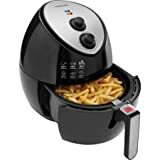 The fact that you can get all of the wonderful flavors and textures of your favorite fried foods in a matter of minutes, with a fraction of the calorie makes owning one of these well worth it. This quick-fix is great for busy people and busy families and would make the perfect gift for the foodies in your life. Cozyna first introduced Cozyna and Cozyna XL air fryers that allow you to set timer and temperature using controls. These models received so many positive reviews. Later, the company launched Cozyna Touchscreen Air Fryer which has become one of the best air fryers on the market. While this model offers so many features including digital control panel for easier use, it is relatively inexpensive when comparing to other air fryers on the market. Trying to shave of some pounds or get in better shape, but don’t want to sacrifice great flavor? 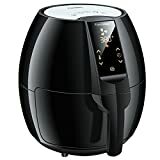 This air fryer is an excellent way injecting serious flavor into your favorite fried foods without having to add all of the calories that you get from using oil in a traditional fryer. Learn more about how an air fryer is good for your health. This versatile fryer gives you the ability to cook foods in a variety of different ways. This fryer isn’t just for frying. You can use it to bake, grill and roast just about anything that you can think of. Whether you want to cook chicken, burgers, cupcakes or vegetables, this fryer has you covered. Learn more about what an air fryer can cook. With traditional fryers you always have to worry about hot oil which can make a huge mess. It makes cleaning your fryer a disaster. This air fryer is super easy to clean, and most all of the internal components of this fryer are dishwasher safe. Since you can set timer and temperature just by pressing on the touchscreen panel, it is incredibly easy to program this device. 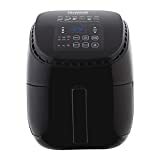 You have time and temperature functions built into this air fryer so that you can simply and quickly program your fryer to the exact settings, and have perfectly cooked, delicious air-fried food in a matter of minutes. Not sure what to start making in your air fryer? What’s awesome is that this model comes with not one, but two cookbooks. You can use them to get some ideas for what you can start making in your air fryer. You have over 50 recipes that you can use to get started and get comfortable with using your air fryer. You’ll get recipes to everything from your basic chicken frying to advanced recipes like molten lava cake. Looking for a great gift idea for someone that you love? 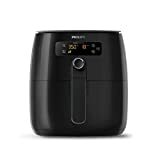 If you have a favorite foodie in your life and you aren’t sure what to get them, this air fryer would make the perfect present for them. You can rest assured that if for some reason that your friend or loved one doesn’t get use out of this air fryer, they can return for 100% of their money back within the first 30 days. You can check out our air fryer reviews to compare this air fryer with others.